If you’ve been in any fashion shop lately you’ll see a silver trend is starting to emerge. I’m personally a massive fan of this – I love the spaceman vibe. I thought I’d have a little online browse and pick out some gems. I’ve put together collages of my favourite pieces in three High Street stores – Zara, H&M and Topshop. Zara are really embracing the silver metallic look, from heels to trainers, from jumpers to jumpsuits. I found a great deal of fashion loveliness on my silver quest. Those platform trainers are so Sporty Spice, I lav em! My favourite piece by far is the silver slouch dress with excessive silver fringing detail down one side of the body and arm. It’s so unique, I love a bit of fringing. It screams 80’s disco. It has a thrown on, unkept messy aesthetic to it. I love how contrastingly tailored and formal cut the skirt is (top right), structured and triangular in shape, it’s very good for elongating the legs and balancing out the hips. And last but certainly not least, look at those pointed wonky heeled boots (top left), the boot slims up the ankle into a sock shape and flow into a pointed toe slimming and lengthening the foot. H&M are one of my all time favourite high street retailers. I worked for them for a while actually! I have to say I’m a bit of a sucker for their Divided items and occassionally their Grey items too, probably because I was a bit of an alternative teenager and still like to dress like that sometimes. Mules have been a thing for a while, I can’t say I actually own a pair to be honest as I prefer a shoe to feel more attached to my foot so I don’t walk out of them. I feel like they have to be a perfect fit to master walking in them. These silver ones are undoubtedly very gorgeous though (top left), they also feature in the outfit (top right) with the metallic skirt, dig dig digging the floppy jumper, skirt combo! Oo and the silver on silver, yes! Who ever said you could have too much? I’m definitely digging the current t-shirt trend and this one (bottom left) definitely dresses an outfit up. I couldn’t resist a Topshop online browse too. Although personally, on this trend search I preferred what H&M and Zara had to offer. I think I’ve got a love hate relationship with these boots (bottom right) are the gemstones outright yucky or darn fabulous? I can’t help but think it’s how a child might decorate their shoes. Collars are a clothing detail I pay particular attention to when buying a garment – high necks are my fave. I love this funnel neck detail on this boxy jumper (bottom left). Topshop provided me with a wearable alternative to the H&M mules I found earlier in this blog post. The heel is much smaller so perfect for spring and daytime wear. 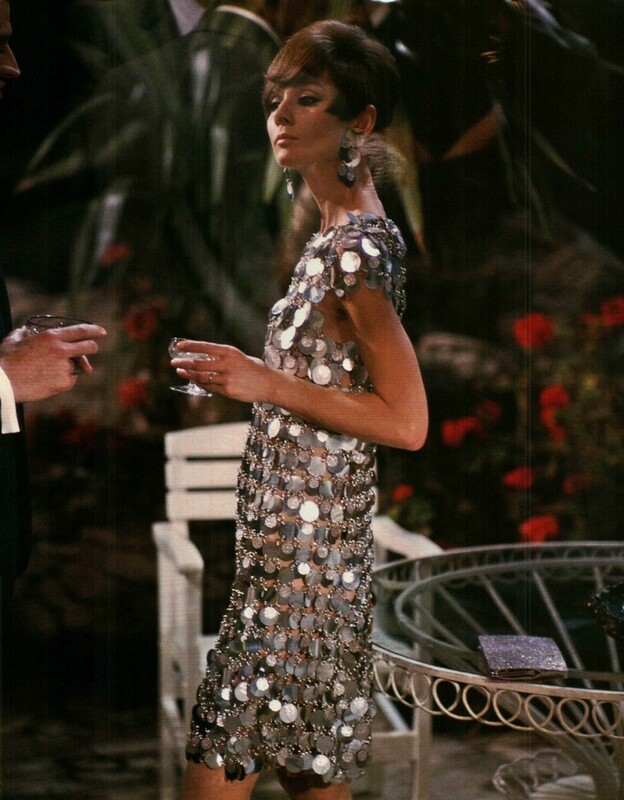 And last but not least, the circular sequined frock, this is so sixties – it reminds me of one of Audrey Hepburn’s looks in ‘Two For The Road’, elegance and retro glamour intertwined. All three fashion stores work to embed silver into fashionable and classically styled items. Styles which may have been prevalent in the 50’s and 60’s are reborn into a contemporary new way of wearing them. I hope to see more silver on the high street and to see people being brave with this trend! Stay tuned as I’m going to be writing a blog post on the metallic pieces I have in my own wardrobe. I love the metallic trend. I recently purchased a huge silver shopper bag from Asos and I love it! Yas love this new trend!